O.K., it’s not Tuesday so this can’t be this week’s Tuesday Project. To accompany grilled steak, a tomato involved salad, and ice cream for a summer Friday night dinner, let’s get a little flash without using any heat outside of the grill. Presenting this fantastic Moroccan chickpea and eggplant salad that can function either as a salad course or a side course. The latter makes more sense to me. And hey, it’s vegan, gluten free, and even dairy free. So everybody can enjoy it! For the spice sensitive, the heat is very minimal here. The salad has three parts essentially. The grilled eggplant which should receive a hefty marinade of olive oil before heading the grill in order to have a crispy char instead of a rubbery, charcoal stained one. When the crispy char is achieved, the eggplant sticks are every bit as addictive as Terra vegetable chips. Instead of cutting the eggplant into large medallions, try cutting them into thin matchsticks and grilling them on a grate. Meanwhile, the star of the show, chickpeas, get drained from the can and tossed with coriander (I used cilantro, your call), and red onion (I slightly caramelized the red onion, but it can be raw too. Your call again). The final part is the dressing added on at the end. The Moroccan spice element comes from equal parts paprika and ground cumin. 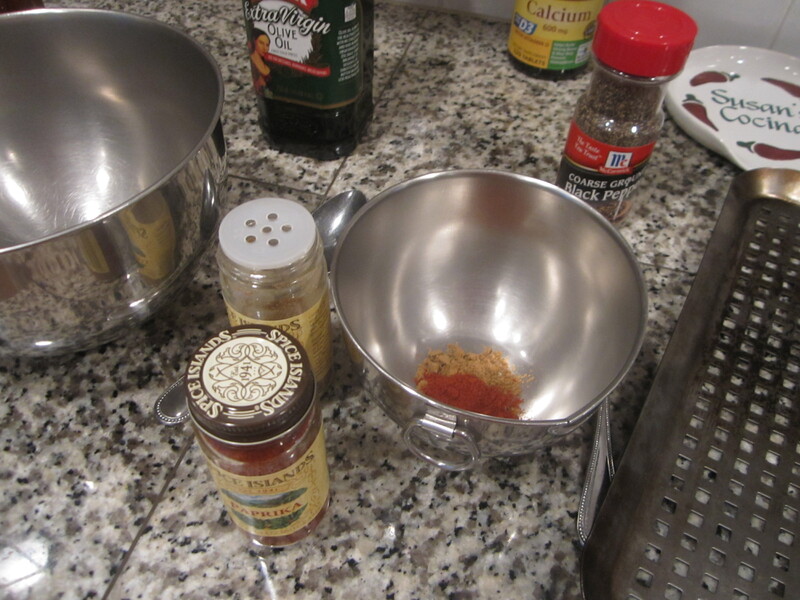 The cumin came on a tad strong at first, so it may be better to try a touch more of paprika to counter the strong cumin flavor. Then again, you really need the cumin taste to be noticeable. Fresh lemon juice, honey, and olive oil round out the simple dressing. Then the question comes of how to time the eggplant on the grill. You could do it before the meat on the grill or do as I did, grill it on the same time. 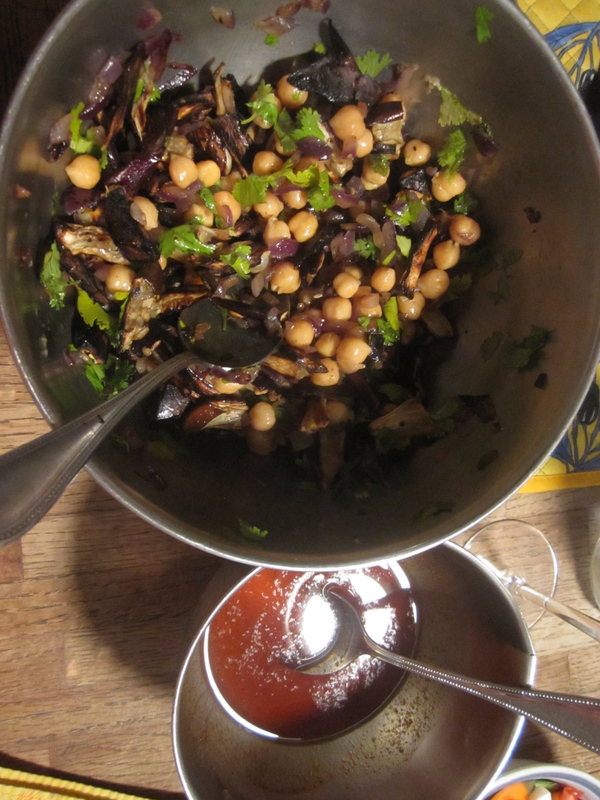 Either way, the eggplant sticks need to be halved or even cut into thirds, then tossed with the chickpea salad. Add the dressing on at the table. What a side dish for summer, with a little trip to Morocco involved too. As a bonus, keep some grilled eggplant sticks aside for munching on. Maybe dip them in some hummus or salsa. Then impress your friends that eggplant, yes eggplant, is one of the treasures of summer. This entry was posted on August 24, 2012 by trevsbistro. It was filed under Tuesday Project .